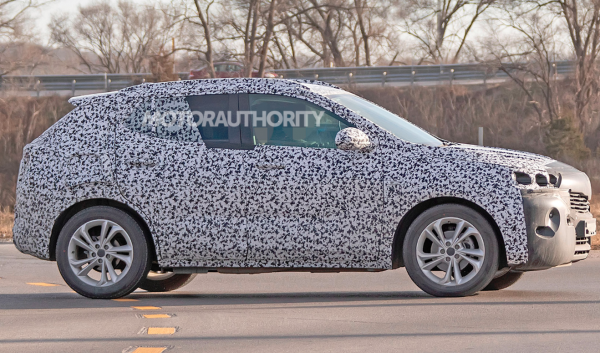 2020 Buick Encore Spy Shots – The Bunch Blog! Buick’s pint-sized crossover, the Encore, is about to get a redesign and we’ve just spotted a prototype. The prototype reveals that the redesigned Encore, just like the current generation, will be twinned with an Opel Mokka X to be sold overseas. Opel’s redesigned Mokka X has already been spotted and is confirmed to go on sale in markets where the German brand operates in 2020. The redesigned Encore is expected in Buick showrooms late this year as a 2020 model. With the popularity of the current Encore, which racked up 88,000 sales in the United States in 2017 and expected to have sold even better last year, Buick’s design team was always going to go with an evolutionary look for the new model, and that’s just what our spy shots suggest. What isn’t so clear is what platform resides underneath. Opel is thought to be using the CMP small car platform of parent company PSA Group for the new Mokka X. It’s possible Buick will also use this platform under license or stick with a platform from the General Motors portfolio. A redesigned Chevrolet Trax related to the new Encore is also due for 2020. The current Encore’s 1.4-liter turbocharged inline-4 is likely to carry over, and buyers should once again be able to choose between front- and all-wheel drive. We could see the current model’s 6-speed auto swapped out for a 9-speed unit in the new model, though. Also look for the new Encore to build on the current model’s abilities with new connectivity options and electronic driver aids. We’ll also likely see Buick launch an upmarket Avenir version this time around. Like Buick’s other Avenir models, the Encore Avenir should boast extra chrome detailing on the outside and better materials and seats inside. Rival subcompact crossovers include the Honda HR-V, Mazda CX-3, Toyota C-HR, and the aforementioned Chevy Trax.